Hey! Great interview :). 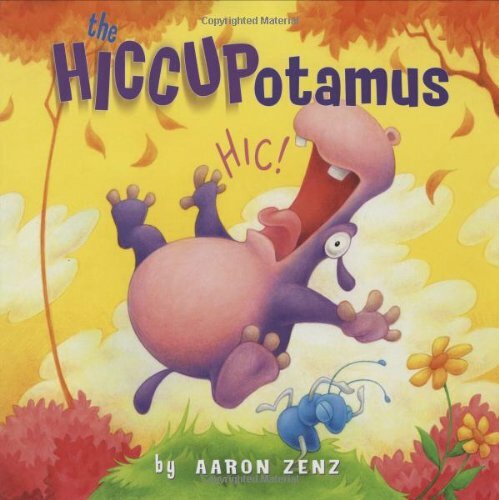 I can't wait to read the Hiccupotamus! Two of my fav funny books are Shel Silversteins, Who Wants a Cheap Rhinoceros? I just love when he sticks his head out of the toilet :). Adam Rex's, Frankenstein Makes a Sandwich is also hilarious! A must read :). Love their blog and would love to read the book. The most recent funny picture book I bought was Knuffle Bunny. I love the moment the mom says "Where is Knuffle Bunny?" and the family racing through the park to get to the laundromat. This is my go-to blog for the funny. Funny picture books? Hmm. I like these new insights to the books review! The book that has captured our family's interest of late is Brandon Mull's "Pingo", it is an excellent addition to a long line of funny picture books. Who Wants Donuts? is a very humorous picture book that is well-loved in our home. But honestly, it doesn't beat our love for Zenz' book. Funny picture books? Hmm...this book is my favorite for silliness. I also like Psst... and any Olivia book by Ian Falconer. We love books! My favorite funny picture books BESIDES The Hiccupotamus (which certainly comes in first place)are John Lithgow's I'm a Manatee and Marsupial Sue and Laurie Keller's Do Unto Otters (and other titles). All are big hits at home with our toddler, too! Thank you for a GREAT interview! I have to say I love love love Alan Durant's Burger Boy. And Christin Ditchfield's Cowlick isn't so shabby either. A great interview. I love the 5 W's. It really is hard to think of someone who does more with double entendre than you ... Congrats Aaron! I immediately thought of Morris the Moose, but when it comes to picture books, I'd have to go with The Cow that Laid an Egg or the Plot Chickens. We don't stray too far from the farm around here! We love Tomie de Paola's Strega Nona series! Yes, Bookie Woogie is well worth a visit. Probably the most unique children's book blog out there. Can't beat a child's perspective or in that case, three. One book I can always count on getting a laugh out of most any child is "Blue Hat, Green Hat" by Boynton. So simple, yet hilarious. My daughter likes a corny, vintage book called "Bennett Cerf's Book of Laughs." Some of the jokes are so lame that it is hard not to laugh. Thanks for the giveaway. Another funny we thats a fav in our house is Daddy Can I Have an Elephant. We currently love books by Bob Staake. He writes "Hello Robots" and "The Red Lemon". They are great! I have a new favorite Otto grows Down. My kinder kids love it! Hmmm. Being in India, I can't enter, but I can comment, can't I? But - how about I enter and give away both the books to friends in US? Best buddies, alter-ego kind of friends? Great interview! I think my favorite funny picture book is Silly Sally, but only because my kids are so funny when we read it! This book looks great. I think you did a fantastic job on the illustrations, which are probably the hardest thing to get right when writing and illustrating preschool books. I have to admit that I have not come across this book yet, so I will need to order one today. Thanks for the great interview.